those of Groenhagen Advertising, L.L.C. Subscription rate is $15 for 12 monthly issues. sanitation are essential in dairy processing, this room, which includes a pasteurizer, a chiller tank, a cheese vat, a three-part stainless steel sink, a stainless steel work table, and a chart recorder, is off limits to customers, visitors, and other non-employees. Sue said. “All that testing gives us a state certification, which is another level of confidence in our product.” “The inspectors take samples from every batch that goes through the pasteurizer,” Noah added. “Each batch is checked for six types of antibiotics. If any of those antibiotics are present, we can’t use the milk. Sue takes samples from every batch to Forbes Field in Topeka to be tested. We have 60 hours to do that, so that’s an average of about two trips a week.” In addition, an inspector makes regular, unannounced visits to the farm to inspect products on-site. Under the roof of a 60’ x 30’ doe loafing barn, Noah pointed to bales of alfalfa. “This is why our goats produce a large amount of milk,” he said. “They average a gallon apiece at the peak of lactation,” Sue added. In fact, two of the Goddards’ does ranked amongst the top 10 milk producers in the Nubian breed in the nation last year. “I’m not going to make any medical claims,” Noah said, “but I believe seniors could really benefit from goat’s milk, whether they used it as a beverage or for cooking.” While the Goddards believe goat’s milk is better for them than cow’s milk, they occasionally drink the latter. “We try not to,” Sue said. 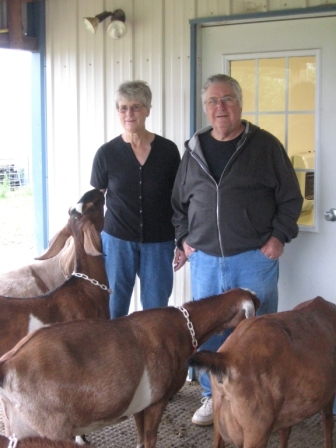 “Goats are seasonal breeders, so it’s a challenge to have the product year round. We usually have a down time Christmas through the first of April when the does are freshening.” Freshening (coming into milk production) occurs at kidding. Kidding is the act of a pregnant doe giving birth. Noah was involved with the criminal justice system for more than 40 years, starting as a rookie police officer in Kansas City. He eventually taught criminal justice at Washburn University in Topeka and worked as a consultant. The couple has three daughters and four grandchildren. For more information about Goddard Farm, which is located at 1801 E. 335th Rd. in Lecompton, please call (785) 887-6083 or visit the Goddards’ Web site at www.goddardfarm.com. The Website includes, among other items, numerous photos of the farm and the goats, nutritional information, and the farm’s licenses.